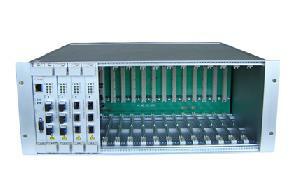 (1~16 ports and long and user optical ports (channel) protection at optical layer in 1~8 ports mode) or OAD. And support various data rate(up to 2.5G). and the long optical ports transmit up to 80Km without relay. Support up to 16 user channels of various protocols and different data rate (100M~2.5Gbps), such as 100M/s FE, SONET, ATM, OC3, OC12, OC48, 1GbE and so on. Pluggable SFP interfaces for both long optical ports and user ports. And the long optical ports transmit up to 80Km without relay. Multiplex 8 or 16 CWDM wavelength Channels and use pluggable CDWM SFP transceiver (up to 2.5 G/s). Both long optical ports (channel) and user ports(channel) Protection at optical layer. In service upgrade for adding more channel, up to 16 slots, 16 CWDM wavelength channels. Flexible application for a few channels to up to 16 channels and the optical protection (user ports and long optical ports) is optional. One 10M/100M Network Management Port for network management and One Console Interface.